Once WatchND started pumping out Notre Dame football fall camp practice videos, I was all in for breaking each one down. It worked great for the first two practices, but then practice #3 happened and saw the video breakdown was a position profile for the CBs. Don’t get me wrong, the feature was great, but a basically started at my title of “Fall Camp Practice Report #3: CB Report” for about an hour and realized there was no way that I could even drag 100 words out of the topic. So I passed on the post. Ten more practices are in the books (ND completed practices #12 and #13 yesterday) across the past eight days and quite a bit has happened. It’s time to play some catch-up. 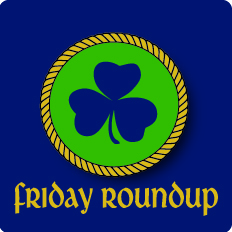 So today, it’s time to enjoy a very Irish-centric special edition of the Roundup. Think of this as the quick way to catch up the past week of fall camp. I will never cease to be amazed at the freaks of nature we have at TE. Koyack should not be able to move as fast for how big he is. Tyler Luata is also an absolute freak of nature. Just check out the pancake he delivers at 3:20 in the clip. Yeah, that’s a freshman. The RB profile gave us no clues on the depth chart battle. The combination of Cam McDaniel, Tarean Folston, and Greg Bryant make this position one of the most exciting on the team. With their talent though, it’s hard to project who is going to come out of the gate as the starter or how all three will rotate. If I could read any of the tea leaves that Tony Alford was throwing out there, it appears that Bryant might have the most work to do out of the trio. Kelly talked a lot about rotations on defense, especially in the front seven. Mentioned that VanGorder’s defense allows the young guys to just go and play on instinct. In fact, for all that’s been made about how complicated the schemes on defense are, I have a feeling VanGorder is scheming to his talent. Kelly seemed frustrated with questions about if ND had their base defense installed. I read that as “we won’t have a traditional base”. Everett can check out of plays, but he probably won’t need to due to the way the offense is designed. No major injuries on the O-line, but with various guys being out for a day, the starting five is still up in the air. Kelly is taking a look at individual competitive drills before he decides who is on the special teams units. You can sub in Jack with a bourbon as well (obviously it kills the Lunchburg namesake, but whatever). Anyone see the news that hit yahoo during lunch? No…what in the world could you possibly be talking about? I thought the exact same thing a out Luatua from that video. I was wondering if that was actually Heurmann vpbecause I couldn’t believe a Freshman had that kind of skill and power. I’m wondering now if we can’t use him as an extra blocker on power looks.